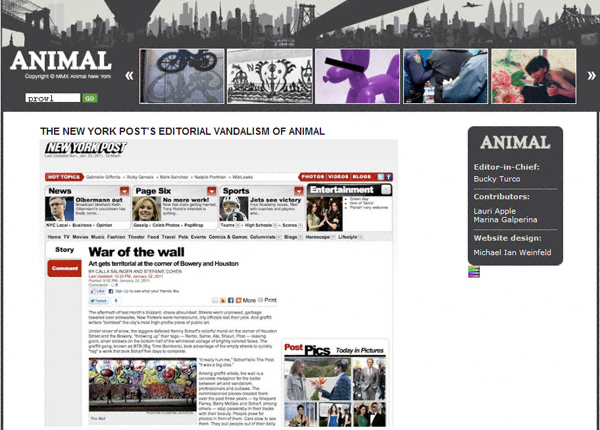 Quicklink: Animal New York Gets Poached! Post policy prevented me from crediting you in print. Allow me to do so now. You did a fantastic reporting job. All I had to do was follow your steps (and make a few extra phone calls). I won’t discuss at length the policy of not crediting blogs (or anyone else). I’ll just briefly explain that as long as we can independently verify every bit of info, we don’t credit. Looking forward to “amplifying” more of your good work in the future. The New York Post credits blogs, bloggers, and other media all the time, as our readers know. Except when they don’t. If the Post followed the above policy to the letter their readership would quickly comprehend exactly how much of the content they are reading has its provenance from online/alternative/independent media outlets (READ: blogs). Welcome to the club, Bucky— and by all means keep on writing! Dozens of reporters depend on people like you and me for their livelihood!